Scientists from the US space agency Nasa have advised the trapped Chilean miners to regulate their day and night sleep patterns. A team of four visiting experts said the men should boost their Vitamin D intake and phase in an exercise program as their nutrition improves. 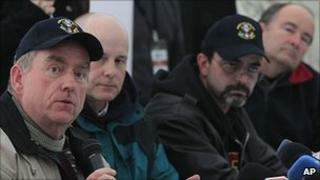 The 33 miners have been stuck in a tunnel 2,300ft (700m) below the ground for nearly a month after a rock fall. Chile's government invited the Nasa team to the San Jose gold and copper mine to offer tips for helping the men keep physically and mentally healthy while they wait to be rescued. "One of the things that's being recommended is that there be one place, a community area, which is always lighted," said Al Holland, a Nasa psychologist, speaking at a press conference outside the mine. "And then you have a second area which is always dark for sleep, and then you have a third area which is work, doing the mining, and the shifts can migrate through these geographic locations within the mine and, in that way, regulate the daylight cycle of the shift." The miners lost an estimated 22lbs (10kg) each during the 17 days before they were found alive. Since then, they have been receiving food, water and medicine through three bore-holes. On Thursday, the men received their first hot meal - meatballs, chicken and rice. Previously they had received only glucose tablets and high-protein milk. Michael Duncan, the Nasa team leader, said that authorities should add an exercise regime to the miners' schedules. "Before our astronauts go into space, we put them on exercise programs and the miners, even though they're doing some work down there, we will want to phase in some exercise programs as their nutrition improves," he added.